Great run this morning in a fun shirt! This morning, I did my first workout since Canada. Kerry and I met at Lady Bird Lake and ran the five mile loop on the trails. It felt wonderful, especially the first few miles. Towards the very end, I could feel my legs tiring, but I’m sure that’s because we were super speedy this morning. Right, Kerry? I had to wear some of my new finisher’s gear from the race. I bought lots of long sleeve stuff and a couple of short sleeve technical tees. This was the one I chose to wear today. It was from the men’s side of the store, but I really liked it, so I got one. 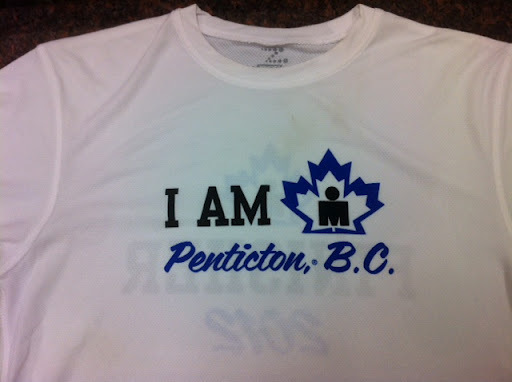 I like that it clearly says Penticton on it, since this is the last year the race would be in Penticton. The finisher’s store is a strange phenomenon. At 5:30 in the morning on Monday, the day after the race, I got in line for the store, which opened at 7:00. When Erin and I got there, there were already about sixty people in line ahead of us. When the store opens, they let a certain number of people in at a time to buy clothing and such that says “Finisher” on it. The whole week, anyone can buy Ironman stuff, but they don’t bring out the finisher stuff until Monday, and then it’s a mad dash for the sizes you want. Smaller women’s sizes especially are hard to find if you don’t get up early and get in line. That’s why I got up at 5:00 even though that meant only getting three hours of sleep on the night after the race. We were among the last few people who got into the store with the first group. And damn, I made out like a bandit. I got a couple of short sleeve shirts, a long sleeve technical shirt, a fitted long sleeve pullover, a looser long sleeve pullover (also from the men’s side), a windbreaker-type biking jacket, a thermal biking jacket, and the race jersey. Obscene, I know, but I won’t be going back to Penticton, and I had a great race, so I convinced myself it was okay. Plus, I actually put a few things back, believe it or not! Clearly, much about the Ironman experience falls to the extremes. 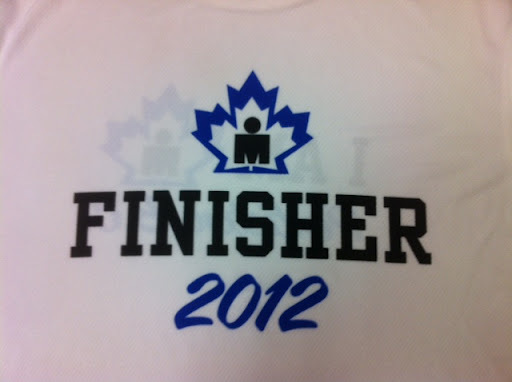 For some of us, that includes the finisher’s store. And for me, that stuff is worth every penny. I’m home. I flew to Portland last week and drove to Penticton, British Columbia, for my third Ironman. This past Sunday, I raced. I raced well. Then I drove back to Portland on Tuesday, and I flew home today. I’m not sure how I can capture this race in words, but I’m going to try to capture at least some highlights. I finished in 16 hours and 22 minutes. My race time didn’t end up starting with a 15 like I had hoped, but this time is still a personal best for me. It was 11 minutes faster than when I raced Coeur d’Alene in 2008, and it’s 30 minutes faster than when I raced this same race two years ago. I’m thrilled. I thought I had a pretty uneventful swim with a few thousand of my good friends, but it turns out I got clawed. 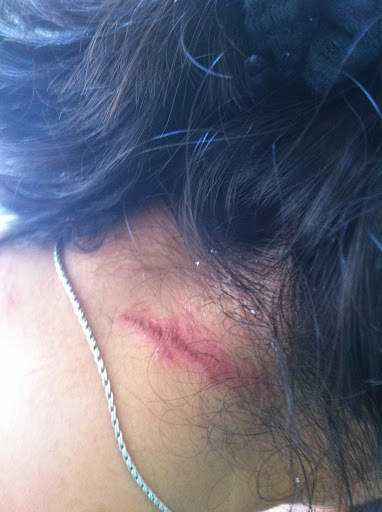 That’s the back of my neck you see, with a lovely two-inch gash. That, a black toenail, and a huge blister on the bottom of my right foot are the extent of my physical wounds from this event. I’d say I came out unscathed. On the bike, I saw a woman have a horrific crash. No other cyclist was involved, and no car was involved. Somehow her wheels just came out from under her and she flew into the middle of the road. I stopped to see if she was okay, and she was. Her shoulders, arms and legs were gashed and bleeding, but she was okay. I was rattled, but I continued, assuming her day was over. Turns out, she got back on the bike. I saw her pass me on the run. Pretty cool of her, huh? That kind of spirit is one of the many things I love about Ironman. Despite witnessing the crash, I had a great time biking. I shaved 50 minutes off my bike time from when I did this course two years ago. I thought my biking was getting better. Now I’m sure of it. I was trying to keep an average of 15 miles per hour. I did well until miles 75 to 90, when I fell short of that goal. But still, it was awesome to ride to the top of the first big climb, called Richter Pass, and think, “Was that it?” Two years ago, I was begging for the top of Richter Pass to show itself, and when I got there, I was gasping for air. I’ve come a long way in two years. I had a long transition between the bike and run because, when I got off the bike, the bottoms of my feet burned like hell. I got changed and ready to run and stood up and promptly fell down. I just couldn’t stand, so I sat in the transition tent for a while, eating and drinking and hoping my feet would recover. That was a first for me. I’ve never felt my feet on fire before. Because my feet killed, I walked the first mile or so. After a much needed pep talk from Erin, I started to run and being on my toes actually helped dull the pain. Once I got to running, I ran steadily until mile 18. Then my right knee started to give, as it sometimes does when I’m tired. So the last 8 miles were a run/walk effort. I was hoping to run the whole thing, but I’m still really pleased with how I did. At the finish, I was laughing and smiling and took the opportunity to high-five the folks in the grandstand leading up to the finish line. I saw my friend Judy do that years ago, and I’ve wanted to do it myself, so this time, I did. It was a great feeling to have the entire front row of the grandstand put their hands up for me in the those final steps. And when I crossed, I received an awesome medal and a too-big finisher’s shirt. Oh, what a feeling! During the race, 82-year old Sister Madonna Buder, the oldest person ever to attempt an Ironman, passed me on the bike. I then passed her on Richter Pass. That woman flies on the flats, and she’s 82! After I passed her on Richter Pass, I managed to hold her off the rest of the way. She finished just ten minutes behind me. They had to create an age group for her — the 80+ category. I want to be racing when I’m her age. The race I did – Ironman Canada in Penticton – is no more. 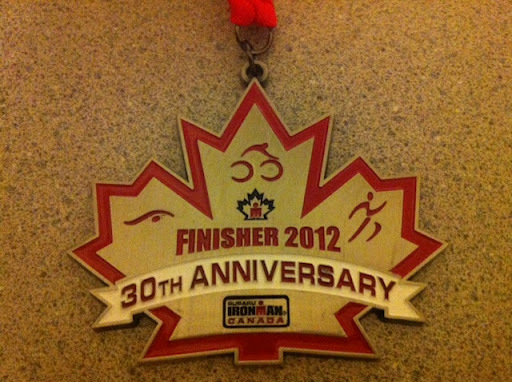 This year marked the 30th anniversary of the race, and it marked the final year the race would occur in Penticton. I’m heartbroken over that because I’ve been going to Penticton since 2009 either to volunteer or race. I love that place and this event, and I’m sad to see it end. I’m thankful for the support I got leading up to this race. Fred, MJ, Catherine and Matt all helped me get in good rides. Jeanie helped me swim and met me for lunch right before I left town. Kerry, Jenny and Poppe helped me get in my runs. And Erin pushed me to do hilly and tough rides that made Richter Pass seem like a mole hill. I am so thankful. I love the Ironman finish line. Each experience is precious, and I’m out to have more. I’m signed up for Ironman Coeur d’Alene in June of 2013, and I’m already excited to start training. Oh, to be like Jordan. I mentioned yesterday that I’m a huge fan of Jordan Rapp. Today, I came across this article on him and his path after a near-death biking accident in 2010. He is an enormous talent with an amazing spirit. He won Ironman Canada last year. It doesn’t look like he’ll be racing there this year. That makes me a little sad because the winners have this tradition of coming to the finish line late in the day to welcome in the folks like me who take all day to finish. I’d love to see him at my finish line sometime, but that won’t happen in Canada. Though he won’t be there, I’ll certainly be remembering how effortless he looked coming back into Penticton as he finished up his run. I’m pretty sure I’ll look just like that.Yep. Just like that. I just spent the last twenty-five minutes watching this video from the awards dinner for the 2012 Ironman U.S. Championship. It follows pros and age group athletes through the day and conveys beautifully the emotion of this race. I’m a huge fan of Jordan Rapp, who is part of this video. I’m also a fan of the age groupers who are featured. Their story is my story and the story of so many athletes who do this thing, not to win, but in an effort to better themselves. Be careful if you decide to click that link for the video. It’ll make you want to do an Ironman. In just eleven days, I will be racing my third Ironman. I’m not packed yet, but in every meaningful way, I am ready. I’ve done focused training for the past six months, including the MS150 in April, a 2.4 mile open water swim and an Olympic Distance triathlon in June, a half-Ironman distance race in July, and the double dam loop and a century ride in August. I’ve spent what I think is an incredible amount of time on the bike because I knew that’s where I stood to save the most time. It surprises me how nervous I am even though this is my third time around the block. Most of all, I want to finish within the time cutoff so that I’m an official finisher, but this year, I have a real sense of my ability to do better than that. I want to finish with lots of time to spare. I would love for my finishing time to start with a 15 rather than a 16, as it has in my last two races. To accomplish that, I hope for a few things. I hope for good weather in Penticton on race day. I hope for a clear path on my swim. I hope for no technical issues on the bike. I hope to feel well-fueled in terms of nutrition when I start the run, and I hope to run comfortably the entire way. Is that asking a lot? Yes. But Ironman is about asking a lot of yourself, so I send those hopes out into the universe, too. What if everything that’s happened so far, Taline, was just practice for when things get really, really good? That’s certainly my hope and prayer where this race is concerned. August 26 is really, really soon. I’m ready for really, really good. This weekend, I did my last somewhat big set of workouts towards Ironman Canada. I rode the Dam Loop on Saturday and ran the trails on Sunday. The ride felt hard even though it was half of what I did two weeks ago when I rode the Dam Loop twice. The run felt hard even though it was only 7 miles. My body was tired. I napped Saturday afternoon and Sunday afternoon, and I went to bed around 7:30 last night and slept pretty consistently until about 7:15 this morning. I woke up a few times and checked email, watched Olympics or fed the cats, but mostly I slept. I had planned to take today off from working out but woke up feeling so much better that I packed a swim bag. If I still feel energized this afternoon, I’ll hit Lifetime Fitness after work for a swim in my favorite outdoor pool. If not, I’ll rest. I’m trying to be careful. I’m a little worried that I’m so tired. I don’t recall being this drained at this point in my training last time around or when I did Coeur d’Alene. Am I getting old? Or have I worked harder? I hope it’s the latter, but I suspect it’s a combination of both. Tapering is always a little hard because I wonder if I’m doing enough, but I need to make myself stick with the program and not exceed the workouts my book says to do. I want to be rested for Canada. It’s less than three weeks away. To get my energy and spirits up, I’m starting a streak of inspirational movies. While I let my body rest, I’m going to build up my mind. Tonight, I’ll be watching Chariots of Fire, a recommendation from my friend Andy. Next up is Rudy, which is perhaps my favorite sports movie. Do you have a suggestion for what should follow Rudy? It’s race month. In twenty-five days, assuming nothing dramatic (like unexpected surgery) happens, I’ll be racing Ironman Canada. I feel like I’ve done all I can to get ready. Since the Rev 3 Half Ironman in early July, I’ve had some big training weekends. One weekend, I rode the dam loop (45 hilly miles) twice one day and raced the Marble Falls triathlon the next day. That was a confidence builder of a weekend because, although my legs were tired from the 90-mile ride the day before, I still raced well at Marble Falls. This past weekend, I went back up to the Pacific Northwest and rode 100 hilly miles. Not every mile was hilly, but it sure felt like most of them were. I never felt like I could rely on momentum to get me up any hill. Each one was a battle. Then the next day, I ran for 90 minutes and again felt stronger than I expect to given the workout of the day before. Dare I say this? I think I’m ready. I’m going hard and long and recovering quickly. I’m still feeling confident on the bike. Between now and the race, I need to stay healthy and diligent and get myself organized so I know exactly what I’m taking with me to Canada. Oh, I also need to get my bike fixed. I had a bit of a flop during my last 100-miler. Towards the end of the ride, I rode a bridge and then had to take a couple of quick turns on tight paths off the bridge to get back on open roads. At the road, we had to make a sharp left turn and then immediately go up a hill. Erin warned me, at least a half a dozen times, about that particular hill, but I spaced out and wasn’t ready for it. I ended up totally in the wrong gear and unable to make it up the short and steep climb. I couldn’t shift or unclip fast enough, so I flopped over and hurt my left knuckles and elbow and my bike. I also got some bruises on my legs, but nothing major happened to me. My bike was my worry. At first, the rear wheel of my bike wouldn’t spin, but Erin messed with it and got it working again so I could finish the ride. Now I need to have it checked out to make sure I didn’t do any real damage. I also need to just have the bike serviced to get it race ready with new tires and whatever else it might need. Each race, but especially each Ironman, I hope for no technical issues on the bike. Race fairy, do you hear me? No technical issues, please. No dropping chain. No flat. No wrecks. No random wildlife prancing on the road ahead of me. No nothing. Just smooth riding, please. Once my bike is fixed and my stuff is packed, I’ll be really ready. I can’t wait to hit the Ironman Canada course again. My hope is to smoke the bike and to run the whole run. No walking, except through water stops. Actually, I take that back. My plan is to smoke the bike and to run the whole run. I’m past hoping these days. I’m doing it.